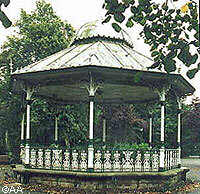 This image of the Band Stand possibly dates from the second decade of the twentieth century. The grounds surrounding it are slightly more developed than in the previous image. In the foreground are two things of interest. On the left is the first of a series of fence posts running the length of the Broad Walk from here to almost Crown Square. Fixed to it is a length of steel cable acting as the horizontal wire; this was formerly used by the tram company to haul the trams up and down Matlock Bank. It was a novel way of using up something that had become surplus to requirements once the cable became too worn or broken for the trams to use. On the right is a drinking fountain, which had been replaced by a more up to date model by the 1950s (see next image). The identity of the two lads facing the camera is unknown. An elderly gentleman is sitting down a little further along the path. There are also two women sitting on the seats to the left of the far side of the Band Stand and they are dressed in summer clothes, probably pre-war in style. 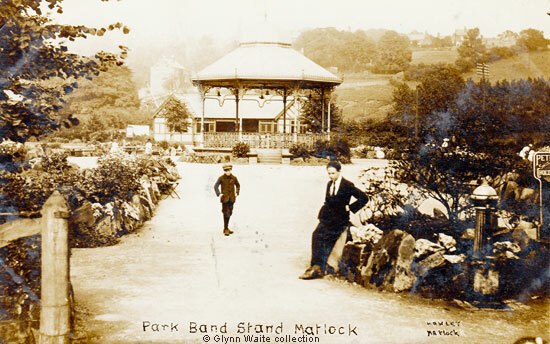 "Park Band Stand, Matlock", published by Hawley, Matlock. Not posted.